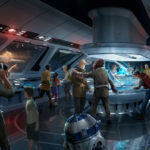 During the recent D23 Expo Japan, Disney released some “living concept art” for the immersive Star Wars hotel that will be coming to Walt Disney World. 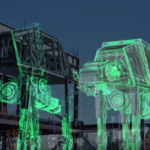 Today, the Disney Parks Blog followed that up with a couple more concept art clips that give us another small glimpse at what this unique experience will entail. 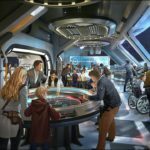 As previously announced, guests to this resort will board a ship “alive with characters and stories that unfold all around them during their voyage through the galaxy – and every window has a view of space!” The hotel will also be connected to Star Wars: Galaxy’s Edge at Disney’s Hollywood Studios, which will complete guests Star Wars experience. 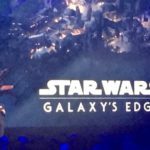 Galaxy’s Edge is expected to open at Walt Disney World in late 2019.